Grind or Remove a Tree Stump? After your tree is cut down, a stump remains. You may choose to keep it and use it as a low table and have picnics there, or you can choose to remove it. If you prefer the latter option, we at Knoxville Tree Service can get the tree stump out for you. If that tree stump is just a useless eyesore on your property and pests live in it, our tree services team can remove it for you. With the stump gone, you can convert your yard into a more useful space. Stump grinding can be a dangerous task, and no business or home owner would attempt or should attempt it. This may be a reason why there are many yards dotted with tree stumps. Our tree service Knoxville team is experienced in stump removal and stump grinding and getting rid of the tree stump on your yard is easy. Our experts know that the root system’s complexity, the tree’s age, the tree’s species, and the stump’s location can make the job tricky. However, the tree service team can remove all kinds of stumps successfully, every day, and in various situations. There are two procedures to deal with a tree stump. One is to uproot the stump physically, including the roots, and the second one is to ground the stump underneath the surface and cover with grass and soil. The latter tree service procedure can harm the landscape less and is the more preferred method for business and homeowners. The stump grinding process can be sloppy, as it creates a lot of dust and debris. As the tree service Knoxville relies on, we guarantee clean tree services and a careful cleanup, leaving your home or business location even more pristine than the original condition. On the day we visit your site, we’ll call ahead. Within two hours, we’re there. We then begin our straightforward process. We use a shovel and rake to clear debris from the area. We’ll then use a chainsaw to shorten the stump until it’s near the ground. The process reduces the material for grounding. Our grinder (Morbark) will then be put over what’s left of the stump and the blades will be driven into the remaining trunk. The process of the blades moving forth and back the stump’s area will continue until the stump is below the surface by 3 to 6 inches. Residue like dust, wood chips, and dirt will be taken away. Grass sod or seed can be planted to restore the site completely. 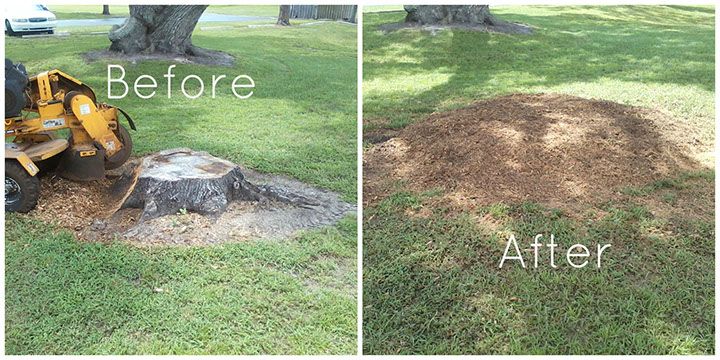 The duration of the stump grinding tree service depends on the tree’s species and size; this normally takes from 30 to 90 minutes. Just be mindful that Knoxville Tree Service uses heavy machinery for this. Our Morbark grinders are used as they minimally impact the landscape. In a few days’ time, you’ll forget that we were ever in your home. Only a patch of grass remains of our work. 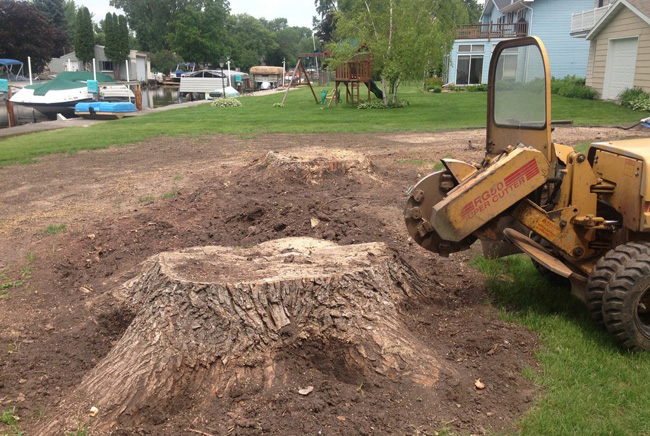 If you have more than one stump in your area, we offer discounts on our services. Call us, the tree service Knoxville relies on for stump grinding needs.